What is the difference between MMA and Brazilian Jiu Jitsu? Mixed Martial Arts is a legally sanctioned sporting event in which participants of roughly equal skill level, strength, size, and experience try to beat each other up in a controlled environment in order to determine which one is the better fighter. Participants must prepare themselves for all areas the fight may take place; (striking, standing grappling with strikes, and ground grappling with strikes). When taken seriously, (as many amateurs do not and all pros must), it is a ridiculously challenging task that has no equal. It is one of the most demanding full time jobs out there with incredibly high stakes on all levels. Nothing has done more to weed out effective techniques and methods of a one on one unarmed conflict than MMA. Brazilian Jiu Jitsu on the other hand is a self defense oriented martial art. Modern MMA owes much of its heritage to Brazilian Jiu Jitsu and the Gracie family. 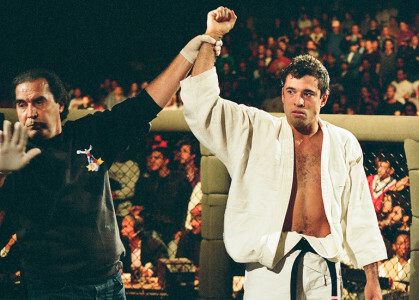 The Gracies utilized the venue of Vale Tudo (old school MMA) to demonstrate the effectiveness of Brazilian Jiu Jitsu in an era when students generally trained one martial art. The Gracies were so confident in their art that they created the UFC as a means to showcase their abilities. In that time Brazilian Jiu Jitsu was consistently proven to be the most effective single martial art. Since then the athletes that fight in MMA events all train some sort of ground fighting art, the vast majority being Brazilian Jiu Jitsu. Sadly many Brazilian Jiu Jitsu practitioners choose to look at Jiu Jitsu as lacking something when compared with MMA. MMA wouldn’t be what it is without Brazilian Jiu Jitsu. Brazilian Jiu Jitsu would be just fine without MMA. MMA is a sport, Brazilian Jiu Jitsu is a lifestyle. In the Brazilian Jiu Jitsu lifestyle you aim to live a healthy balanced life and avoid getting into fights. MMA practitioners train for the certainty of a fight against someone else, who is training equally as hard with the intent of beating them, so that their career might advance and their opponent’s career goes the opposite direction. Mastering one martial art is a daunting task, however it can be done, even with a busy work and home life as long as you are diligent and consistent in your training. Learning many martials arts, (remember it is mixed martial arts), required to be successful at MMA is a task that can only be accomplished if it is your full time job. While some people are content as lifelong dabblers, I find that many wish to master one martial art that can mesh well with their life and enrich it. You can’t learn striking without sparring, (getting punched in the face), and you’re not going to learn wrestling without being taken down (falling repeatedly with someone landing on top of you). Jiu Jitsu is a martial art that you can learn and go to work the next day without looking like you’re in fight club. MMA isn’t something you are going to gain any appreciable skill with a hobbyist dedication. Jiu Jitsu though is something you can develop a very high level of skill at with consistent diligent practice even with a busy life. As the aim of Jiu Jitsu is to improve your relative position and not to inflict damage on another person, you can, in time, practice with 100% resistance. In Jiu Jitsu the goal is to a) stay safe, b) advance your position, and c) finish the fight. An altercation is ended using a joint lock or choke hold. A joint lock doesn’t necessarily mean we break someone’s arm and that ends the fight. The skill required to take someone down and immobilize them is often such a strong show of physical dominance that no further proof is needed to dissuade the opponent to stop fighting. In the case where that is not enough proof, the Jiu Jitsu practitioner can move to a choke which renders the opponent unconscious. While defending oneself is often the initial draw of martial arts training, I believe that it is generally pretty difficult to get involved in unless you are looking for trouble. Trouble is generally easy to avoid by paying attention, being a productive member of society, and not involving yourself in silly ego contests. That said, even the most upstanding citizen doing his or her best to avoid trouble can find themselves in a spot where they need to defend themselves. In that moment, the person that a) understands the depth of what is unfolding, b) has the confidence in their ability, and c) initiates promptly is most likely the one that will get the better end of the altercation. A much more common reason to train is the fear associated with the idea of someone physically dominating you. No one wants to get bullied or be physically intimidated. There is a strong calming effect that comes with knowing you can physically handle yourself, and the emotions associated with conflict. This carries over to all conflict. Physical safety is a very base-level need. Normal day-to-day life is filled with all sorts of conflict that in no way is going to turn physical. It is often difficult to convince your nervous system of this. You get in a heated argument with someone, have a stressful situation at work or get stuck in traffic too long and your body responds as though a physical conflict were right around the corner. In reality, unless you make the situation physical (immature), or someone else does and you don’t see it coming (unfortunate), 99.99% of these situations are going to remain a non-physical, yet emotionally charged situation. It is remarkably unhealthy, physically and mentally, to spend a great deal of time in this state of heightened emotional and physical readiness. A part of developing ourselves into optimally functioning people is learning to manage this physical state. This is where martial arts training is unparalleled. In a safe environment you learn to identify, dissect and manage physical conflict. In a very short period of time you learn to manage the emotions associated with physical conflict. When you have the ability to manage emotions during physical struggle, you can manage emotions amidst non-physical conflict with remarkable clarity and grace. It is akin to preparing for a marathon at high altitude while wearing a weight vest on rough terrain, then running the race at sea level with no vest while running on a track. While fear of physical conflict causes some to seek out martial arts training, fear of being humiliated or embarrassed in martial arts classes prevents many people from walking through the Academy door at all. I have had many students, who years after we have trained together, tell me that they almost didn’t walk through the door in the first place for that very reason. What is worse is that at many schools, there is a fight club culture where social rank is given to the person that beats up on other students the most. As someone that has benefited greatly from Brazilian Jiu Jitsu it is disappointing to see this exclusive culture persist. It benefits very few people and greatly impedes the art being effectively spread. The reason we call this a Brazilian Jiu Jitsu Academy is because people are here to learn. I have no desire to run a fight club, and I don’t let bullies in my school. When one gets past my radar, they are asked to leave. I am only interested in students that want to learn, improve themselves, and in the process help others improve. That said, one of the beautiful things about Brazilian Jiu Jitsu is that you can practice with full resistance and gain confidence in your skills. The trick that many schools miss is that the path a student travels from knowing nothing, to practicing at a 100% resistance is one that the student must be guided along carefully while being offered much support and instruction. All too often students are left to their own devices with little help along the way. You can learn to swim, (a little), by being thrown into the water, however you are probably not going to develop a love for the water. Hard training is essential to being able to fully understand Jiu Jitsu, and when you are introduced to it correctly you can learn to thrive there. Talking about training though is the easy part. The tough part is taking action by coming in to watch or participate in a class. We’ve made that as easy as we can. Simply sign up for a free class below. If you would prefer to observe a class first please call/text, 360.329.2289 or email us.